Curious how to cook with fennel? This crunchy bulb has a similar texture to that of celery. Fennel has a white, edible bulb that can be sliced and added to a winter salad or braised with a bunch of onions. The stalks and leaves are edible and great served with salads, garnish and soups. Fennel seeds are used in recipes (like this one and this one), and are often compared to anise or licorice in taste. The fennel bulb is an excellent source of vitamin C and contains phytonutrients. Fennel is also a good source of fiber. 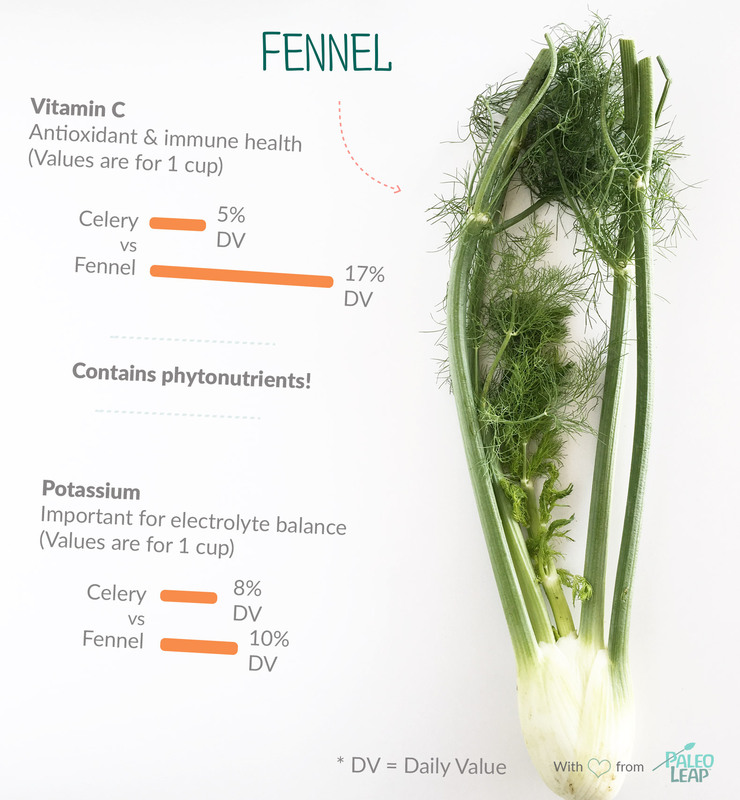 Find fennel at your local farmer’s market in the late fall through spring season. Saute or braise fennel with other veggies, or add it to a winter salad. Orange dots show how 1 cup of fennel fits into the typical nutrient profile of a Paleo meal. SELECT: Choose a clean, firm bulb with firm and crunchy stalks. There should be not bruising or browning on the bulbs, and the stalks should not be soft. SEASON: Fennel is in season from from fall through early spring, so fennel can make a great addition to a winter salad. STALK, BULB, SEEDS: The stalk, bulb and seeds are all edible. Dried fennel seeds should be stored in an airtight container. Combine radicchio, fennel and pecans with a citrus vinaigrette for a simple winter salad. Braise fennel with butter, lemon and salt. Add fennel to a classic slaw salad. Saute fennel and onions for an easy side dish.